With its bold lines and taut features it just might make the grade at the New York International Auto Show. After all, the last two winners were the Volkswagen up! in 2012 and Nissan Leaf in 2011. The Mazda6 is the production model that evolved from the TAKERI Concept, first introduced at the 2011 Tokyo Motor Show. It is steeped in the brand’s KODO Soul of Motion design mantra that seeks to emulate the power, form and agility of wild animals. As a sports sedan the Mazda6 easily distinguishes itself from the people movers of the competition, but this year boxy and teardrop shapes are absent from the Six’s contenders, namely the Aston Martin Vanquish and Jaguar F-Type. The urban utilities of past years have fallen away, along with this year’s entries from Volkswagen, Land Rover and Renault. The World Car of the Year award is now in its 11th year, having first been awarded in 2003 to recognize and encourage automotive excellence on an international scale. A jury of 66 recognized automotive journalists from all over the world evaluates entrants. For focused categories, such as Green Car and Design, a panel of authorities in the appropriate field reviews each entry, providing recommendations to the jurors. Leading design experts for this year are Masatsugu Arimoto of Japan, Silvia Baruffaldi from Italy, Gernot Bracht based in Germany, Sam Livingstone of the UK and Tom Matano representing the US. Should the Mazda6 win the World Car Design of the Year it will be only the second time – the brand won the award previously in 2008 with the Mazda2. 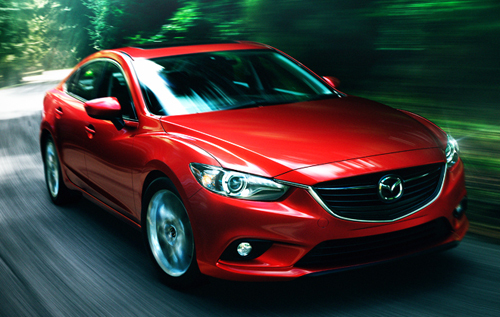 Already available at local dealers, the 2014 Mazda6 is based at $20,880 minus destination charges. It is only the second vehicle to fully incorporate Mazda’s SKYACTIV Technology, an engineering approach to boosting overall vehicle efficiency. Delivering exhilarating performance at the same time as improved fuel economy, the 2014 Mazda6 gets up to 38 miles per gallon from the 2.5-liter gas engine. A SKYACTIV-D 2.2-liter clean diesel engine will be optional on the 2014 Mazda6 in the last half of 2013. We repeat this information is completely unconfirmed.